An estimated 405 million people – or about 6% of the world’s population – were adherents of folk or traditional religions in 2010, and that number is expected to grow to 450 million by 2050. This increase will not keep pace with overall population growth, however, and the folk religion population is expected to drop to roughly 5% of the total world population in the decades ahead. Folk or traditional religions are faiths closely associated with a particular group of people, ethnicity or tribe. They often have no formal creeds or sacred texts. Examples of folk religions include African traditional religions, Chinese folk religions, Native American religions and Australian aboriginal religions. In addition, the boundaries between folk religions and other religions are blurry in some contexts. For example, anthropologist Tik-sang Liu observes that for ordinary people in Hong Kong and Macau, “there is no clear boundary between Buddhism, Taoism and local [folk] religious practice.”47 In sub-Saharan Africa, many of those who identify with Christianity or Islam – and thus are counted in this study as Christians or Muslims – also incorporate elements of African traditional religions into their lives.48 Moreover, folk and traditional religions are not always offered as response categories in large-scale demographic and health surveys in the region. Amid these uncertainties, the folk religion population is expected to grow at a slower rate than the overall population in the coming decades. In the 2010-2015 period, the expected annual growth rate of the folk religion population is 0.7%, compared with 1.1% for the general population. Both the overall world population and the folk religion population are expected to experience a decline in growth rates in coming decades. 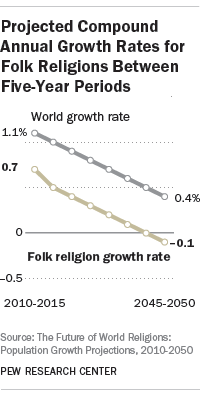 The growth rate for followers of folk religions is expected to turn negative starting in 2040, representing not just slower growth but actual decline in the population. As of 2010, adherents of folk religions were most prevalent in the Asia-Pacific region, where nine-in-ten (90%) members of the world’s folk religion population resided. The remaining followers of folk religions were concentrated in sub-Saharan Africa (7%) and Latin America and the Caribbean (between 2% and 3%). 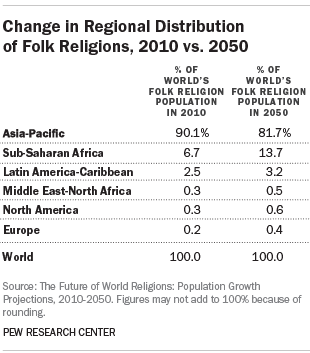 In the decades ahead, the share of the world’s folk religion population living in the Asia-Pacific region is expected to decline somewhat, to 82% by 2050, while the shares living in sub-Saharan Africa and the Latin America-Caribbean region are expected to increase (to 14% and more than 3%, respectively). In the coming decades, adherents of folk and traditional religions are expected to increase in absolute number in every region of the world. In Asia and the Pacific, for example, the folk religion population is expected to grow by a few million, reaching 367 million in 2050. However, the share of the Asia-Pacific region’s population that follows folk religions is projected to decrease from 9% to 7% during this period. 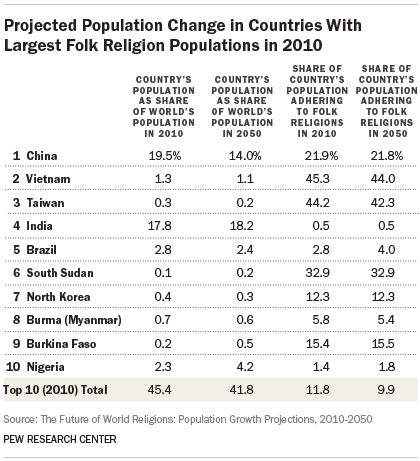 Similarly, though the folk religion population in sub-Saharan Africa is expected to double in size to more than 60 million by 2050, adherents of folk religions are expected to remain about the same as a share of the region’s population (slightly more than 3%). 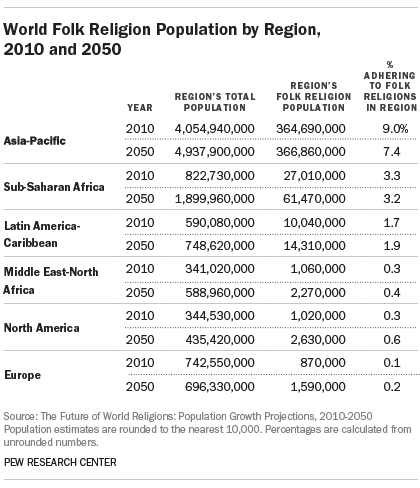 In future decades, there are expected to be a few million more followers of folk religions in Latin America and the Caribbean (14 million in 2050 vs. 10 million in 2010). 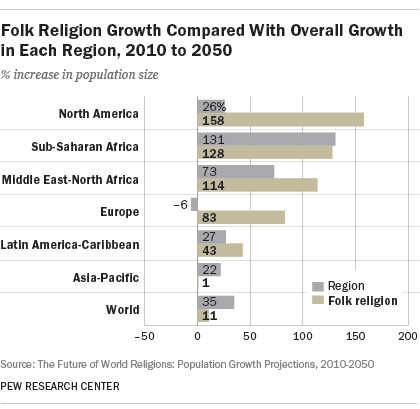 Between 2010 and 2050, North America’s folk religion population is projected to experience a high rate of growth (158%), due to a combination of immigration, religious switching and the relatively small base folk religion population in 2010. The second-fastest growth among followers of folk religions is anticipated in sub-Saharan Africa, where the rate of growth among the folk religion population (128%) is projected to be similar to the region’s overall rate of growth (131%). 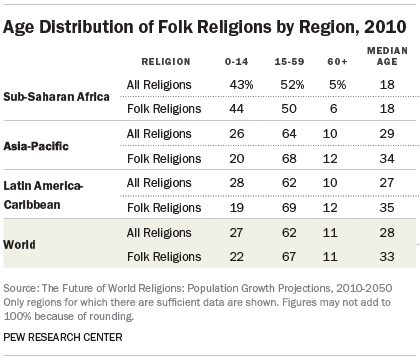 In future decades, the folk religion population in Latin America and the Caribbean is expected to grow somewhat more (43%) than the region overall (27%). By contrast, the folk religion population in Asia and the Pacific, in percentage terms, is expected to be relatively flat (1% growth), while the region’s population overall is forecast to experience modest growth (22%). 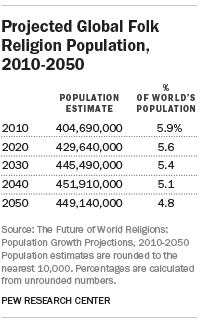 Adherents of folk religions are not heavily concentrated in countries that are expected to experience large population growth between 2010 and 2050. China, home to the largest folk religion population, is expected to have 14% of the world’s population in 2050, down from 20% in 2010. Among the 10 countries with the most adherents of folk religions in 2010, only Nigeria and Brazil are expected to see sizable increases in the shares of their populations belonging to folk and traditional religions. 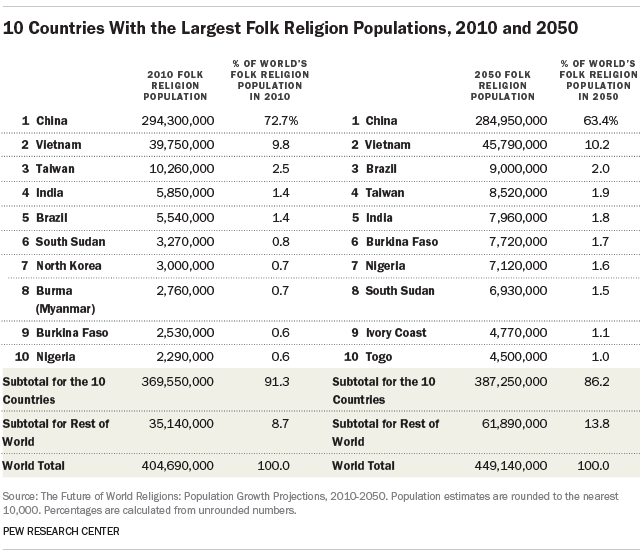 In each of the other countries on this list, the share of the population following folk religions is expected to stay about the same or decrease slightly. For example, the share of China’s population that belongs to folk or traditional religions is expected to remain at about 22% in the decades ahead. China was home to a majority (73%) of the world’s folk religion population in 2010, with nearly 300 million adherents of folk religions living there. Sizable folk religion populations also lived in Vietnam (40 million), Taiwan (10 million), India (6 million) and Brazil (between 5 million and 6 million) in 2010. No country had a clear majority of its population practicing folk religions as of 2010.49 However, more than 40% of people in Vietnam (45%) and Taiwan (44%) were followers of folk religions. In 2050, as was the case in 2010, China is expected to have a majority of the world’s folk religion population (63%), although a smaller majority than it had in 2010 (73%). Vietnam is expected to remain the country with the second-largest folk religion population, with 46 million (about 10% of the world’s total). By 2050, Brazil is forecast to have the world’s third-largest folk religion population (9 million), surpassing Taiwan and India. Two countries in sub-Saharan Africa – Ivory Coast and Togo – are expected to join the list of countries with the 10 largest folk religion populations by 2050. With a Total Fertility Rate (TFR) of 1.8 children per woman, followers of folk religions have lower fertility levels than the world’s overall population (2.5) from 2010-2015. In fact, the TFR of the folk religion population is below the replacement level of 2.1 children per woman (the number considered necessary to maintain a stable population, all else being equal). Data on the fertility of adherents of folk and traditional religions is not easy to gather on a regional basis, primarily because of the many different religious groups that make up the category. Nonetheless, there are some notable fertility differences in a few regions. In sub-Saharan Africa, for example, the TFR for the folk religion population in the 2010-2015 period is higher than the rate for the region overall (5.1 vs. 4.8). By contrast, the TFR of the folk religion population in Latin America and the Caribbean is substantially lower (1.4) than the rate for the region’s total population (2.2). 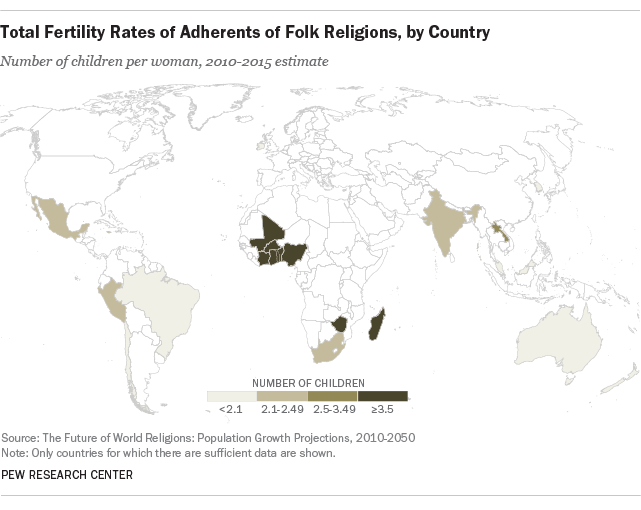 Fertility rates for adherents of folk religions are highest in sub-Saharan Africa, where Total Fertility Rates for the 2010-2015 period range from 7.5 in Mali and 7.0 in Nigeria to 3.2 in South Africa and 4.7 in Zimbabwe. Outside of sub-Saharan Africa, fertility rates vary from 3.8 in Laos and 2.7 in India to 1.0 in Brazil and 1.2 in Chile. 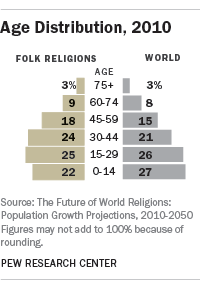 Globally, followers of folk religions were older as of 2010 (median age of 33) than the world’s overall population (28). In the Asia-Pacific region, where most adherents of folk religions live, the group’s median age (34) was five years older than the median age of the region as a whole (29). In Latin America and the Caribbean, the median age of the folk religion population (35) was eight years older than the regional median (27). In sub-Saharan Africa, however, the median age of adherents of folk religions was the same as that of the general population (18). 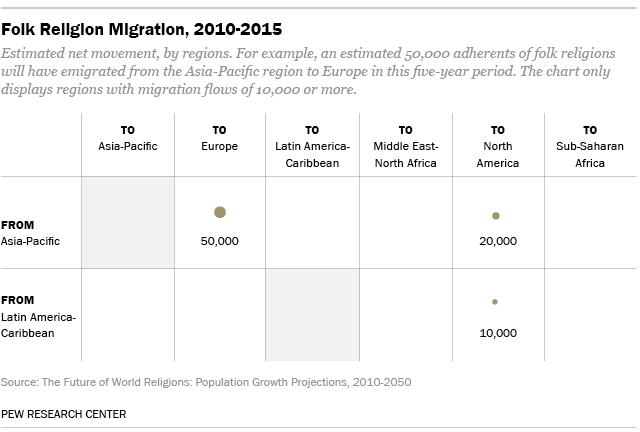 In the main projection scenario described in this report, religious switching is factored into the population projections for all 70 countries for which sufficient data are available. In an alternative scenario, however, no religious switching was modeled in any country. Comparing results between these two scenarios gives a sense of how much impact religious switching is expected to have on the size of the folk religion population in the years to come. In some regions, including Latin America and the Caribbean, a greater number of people are projected to become followers of folk religions in future decades than are expected to leave folk religions for other religions or no religious affiliation. 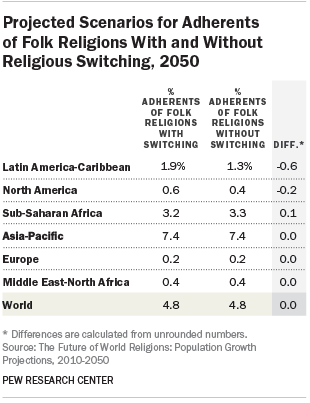 This net increase in people identifying with folk religions is expected to make the percentage of people in the Latin America-Caribbean region adhering to folk religions higher than it otherwise would be (1.9% of the 2050 population with switching vs. 1.3% without switching). The impact of religious switching is expected to be particularly strong in Brazil, where the Spiritist movement is growing.50 By 2050, if religious switching is factored into the projections, Brazil is expected to have 9 million adherents of folk religions; if religious switching is not included in the projection model, the number drops to 4 million. With a relatively small folk religion population worldwide, and an even smaller number of migrants who belong to folk religions, migration is not expected to significantly alter the number of adherents of folk religions in various regions of the world.